Hungary wins 4th place and two special prizes, among the 24 participating countries selected for the grand finale of the Bocuse d’Or, the world's most prestigious cooking contest that celebrates its 30th anniversary this year. When Hungarian chef Tamás Széll and his team won the European final of Bocuse d’Or last year, they qualified to take part in the World Final in Lyon, France on January 24-25. 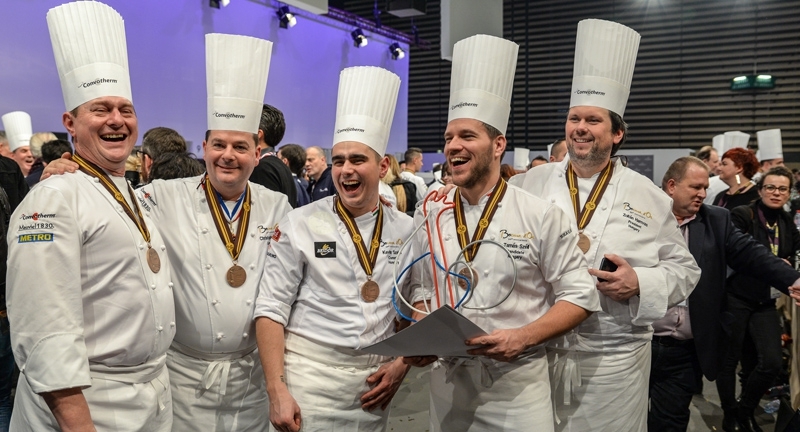 Following long months of practice and rehearsals involving much abnegation and extreme concentration, the team was ready for the very intense, two-day competition - an event that revealed the new stars of gastronomy worldwide and also marked the 30th anniversary of this unique contest that was created by Paul Bocuse, the founder of haute cuisine. Performing live in front of thousands of people that included some 300 enthusiastic Hungarian supporters, Tamás Széll and his team finished 4th, with 1565 points. In first place, Mathew Peters, from restaurant Per Se (New York) representing United States won the Bocuse d’Or and 20,000 euros in prize money. After Years of relentless quest, Team USA wins a well deserved 1st place, after the 2nd place reached in 2015. In second place, William Davidsen, chef of 3 restaurants (Trondheim) representing Norway, won the Silver Bocuse and 15,000 euros in prize money. Norway now has a history of 10 podiums including 5 Bocuse d’Or. The country confirms its incredible regularity in the first places and takes once gain its cuisine to the highest level on the international scene. In third place, Viktor Andrésson, chef au restaurant Grillio du Radisson Blu Saga (Reykjavik) won the Bronze Bocuse and 10,000 euros in prize money. Regularly placed in the top of the ranking, the country comes back on the podium after a 3rd place in 2001. The three winners have the privilege to integrate the prestigious Bocuse d’Or Winners Association. “Bresse chicken with shellfish”: this was the very first theme proposed back in 1987 for the first edition of the Bocuse d’Or. This classical recipe of Lyon and French cuisine has since become a universally classic dish and seemed the natural choice for the theme to be served on a tray to celebrate the 30 years of the contest. More than a reference, the event successfully challenges the participants’ imagination and technical skills to deliver a modern interpretation of this emblematic dish. As the Bocuse d’Or is also a resolutely modern contest, the new “Vegetal” theme was a natural choice for the recipe to be presented on a plate. How to compose a tasty dish, generous and subtle without using any meat of fish? This is the daring albeit highly responsible challenge the 24 finalist had to face.